Receive a personalized Columbiana County home value report for your residential property in Columbiana, East Liverpool, Salem, East Palestine, Hanoverton, Leetonia, Lisbon, Minerva, New Waterford, Rogers, Salineville, Summitville, Washingtonville, Wellsville, Butler, Center, Elkrun, Fairfield, Franklin, Hanover, Knox, Liverpool, Madison, Middleton, Perry, Salem, St. Clair, Unity, Washington, Wayne, West, Yellow Creek, Calcutta, Damascus, East Rochester, Glenmoor, Homeworth, La Croft, Lake Tomahawk, and Negley. 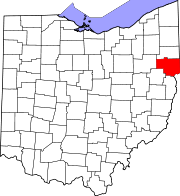 Find out how much your current or prospective Columbiana County primary residence or investment property is worth in less than 24 business hours. We manually research every subject property, compile the data and then have a professional processor evaluate it. We do not rely upon automated property valuation models that often fail in determining the true market value. Instead, we independently investigate and analyze each property every time using the latest data available from official sources. And the best part is that we are a trusted unbiased source of information that is in no way affiliated with buying or selling real estate. We also research other areas nearby such as Achor, Bayard, Cannons Mill, Chambersburg, Clarkson, Dungannon, East Carmel, East Fairfield, Elkton, Franklin Square, Fredericktown, Gavers, Glasgow, Guilford, Highlandtown, Kensington, Lynchburg, Middleton, Mill Rock, Millport, Moultrie, New Alexander, New Garden, New Middleton, New Salisbury, North Georgetown, Reading, Teegarden, Unionville, Unity, Valley, West Point, Williamsport, and Winona.